Iraqi advances in west Mosul have been steady, while a recent counter attack by the Islamic State in liberated areas of the city has slowed them down. The army’s 15th Division is moving along the northern axes of the Old City and freed Mashahda in the northwest corner of the district. The Federal Police are working along the southern edge of the Old City and down the middle. They freed Bab al-Baid for the second time and Ras al-Jadda. Federal Police commander General Raed Shakir Jawadat said his forces were pushing towards Qurnish along the Tigris River, which would bisect the district in two. At the same time, units from the Golden Division were diverted to Yarmouk, Tanak, and Rajam al-Hadeed where IS launched a surprise attack on June 25. 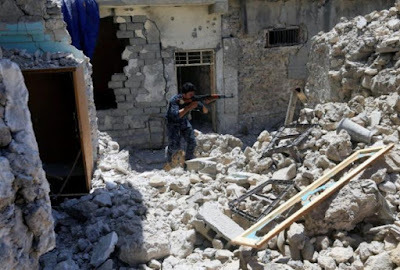 Seven IS fighters were killed in Yarmouk, and the Iraqi forces (ISF) were carrying out mass arrests there, Tanak, and two other neighboring areas. The cordon around the Old City was also tightened to try to prevent any infiltrations by insurgents. Finally, the army’s 9th Division was still attempting to seize the Republican Hospital and other buildings in Shifa, which is to the north of the Old City. Overall, the War Media Cell announced that 50% of the Old City was now under government control, and IS down to seven neighborhoods. On June 25, the Joint Operations Command claim IS had six areas that somehow was only 1% of the Old City, while the Golden Division said 65-70% of the district was cleared. The ISF have made two big thrusts into the Old City to divide it into quarters while others are moving along the north and south perimeter. Progress has been on going, but slow. The IS pocket is collapsing, but it is still putting up a hefty fight. With victory around the corner however, Iraqi propaganda has gone into overdrive with constant stories of IS being done, the fight almost being over, and the constant shifting and contradictory reports on how much is left to be done. Outside the Old City, IS was still attempting to sow chaos. A group of IS fighters were interdicted trying to cross the Tigris River from west to east Mosul. They were killed, and found to be carrying a number of sticky bombs, explosive belts, and other armaments. Every day since June 23, insurgent cells have been trying to carry out attacks in liberated sections of the city, and in the surrounding towns. Finally, after several days the army’s 15th Division was back at work in the Tal Afar district. Seven villages to the east of the town were seized. The unit has been given the task of taking the village, but at the pace it is moving at it may be waiting for Mosul to fall before it makes an actual push on Tal Afar. This was a disappointing move for the Hashd who surrounded the town months ago, but were blocked from moving further by Baghdad due to complaints from Turkey.